I was so excited to receive this game in the mail and be able to dive in it with my girls. We have always actually taught the girls to use their manners, but this game was just the icing on the cake. Even though this game is a teaching game, does not make it boring AT ALL. I was giddy as a young school girl playing this game with the girls. So fun to see the girls say “please” and “thank you” while just playing a game. 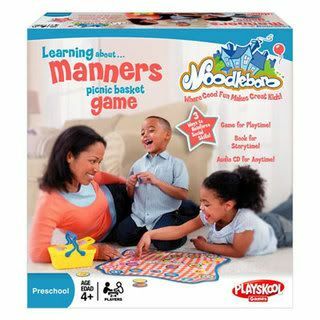 With this particular game, we are pretending to be on a picnic and trying to keep all them pesky ants away by using our manners. What a hoot… Love it. The game also comes with a book and audio CD. Both are big hits for bedtime and just for taking a chill out from the day! Also just to show you the “manner using” carries on past the game… we went outside right after playing the first game. The girls were playing with different toys and my youngest said… “Madisyn, may I please have that toy to play with?” Girrrrrrrl…. did you just say that to your sister? Oh yea… that’s what I’m talking about. The game is still a huge hit with the girls. I am definitely telling Santa to add the other Noodleboro games to his wish list for the girls. Shhhh don’t tell them ;). Click here to learn more about the games. Wow that sounds like a great game! casual friday everyday’s last blog post..Free Bird? I love games like this. The sad thing is, the kids that need to play these games don’t have parents that 1) are already teaching them values and morals, and 2) would actually sit down and play a game with them.